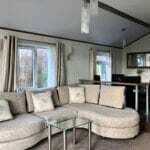 New to our pre-owned caravans for sale is this exceptional holiday home. Situated at the very top of Pheasant Wood this pitch has the luxury of privacy and tranquility, combined with beautiful distant views towards the elegant spa town of Harrogate. 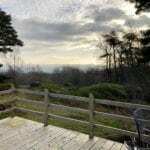 34 Pheasant Wood boasts a bespoke wraparound decking designed to make the most of the woodland setting while offering easy access to the large patio area where you can enjoy the peace of being nestled into the woodland while enjoying the views beyond. With guaranteed Nidderdale sunshine, it is one of our most favoured pitches on the park! 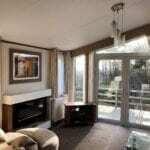 The Concept Lodge really does set the Standard for the contemporary leisure home. 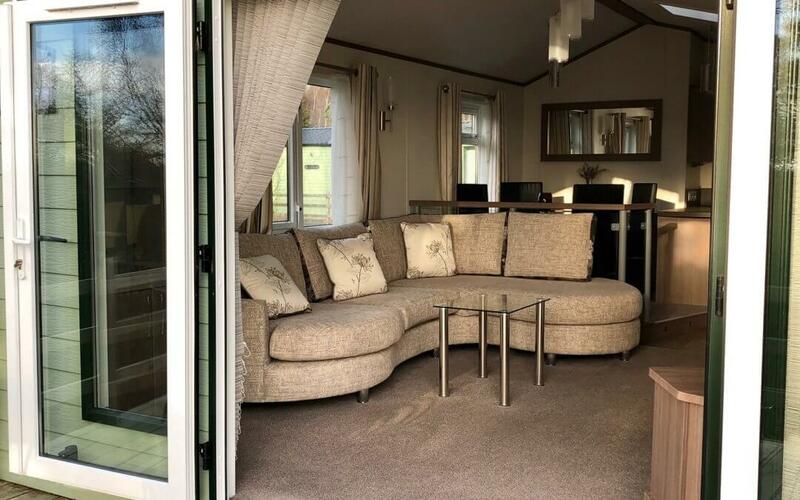 This 2014 41×13 model comes in residential specification with central heating, double glazing and the extra luxuries of a washer dryer and en-suite with a bath. Even the exterior, portrays quality with it’s style feature of an asymmetrical roof. 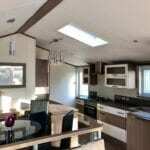 Its high vaulted ceilings and velux window ensure the caravan is flooded with light. The open plan layout of the lounge area leads you into the stunning, highly specified kitchen, specifically designed for luxury holiday living. 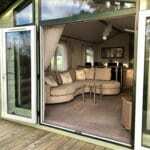 The double patio doors ensure that you can even enjoy the view from the comfort of the sofa. The Concept Lodge gives you all the benefits, style and luxury of urban living while nestled into your very own woodland, country retreat. 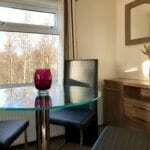 This Luxury Holiday Home is now sold.